Here you will find a variety of dinorific activities to celebrate One More Dino on the Floor, the new book from Albert Whitman & Co. by Kelly Starling Lyons and illustrated by Luke Flowers. Thank you for supporting One More Dino on the Floor, and celebrating along with these creative dino activities! You've read the book, you've counted the dinos, you've danced along on their adventure. NOW it's your turn to bring these dinos to life with your own creativity! 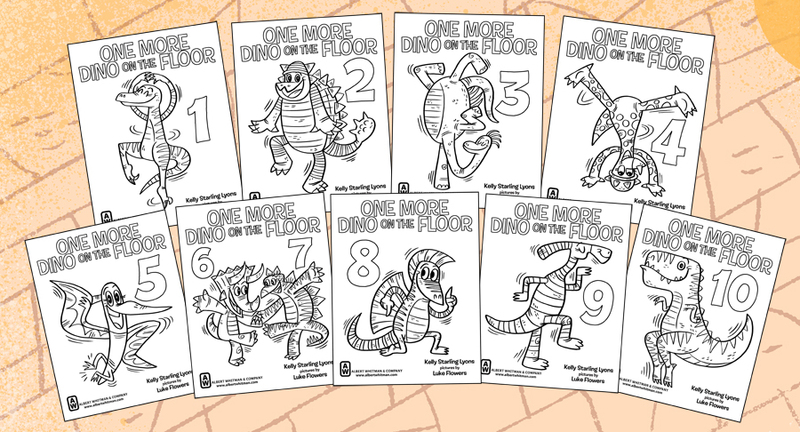 Color them all and add your own dynomite backgrounds, music notes, or tiny dino friends! Be sure to share with your friends and family! ROARING FUN T-REXCELLENT PAPER PUPPET! Now you can bring T-REXCELLENT to life and have him join in your dino dance party or read along with this paper puppet! Color him in, cut him out, assemble him and let the ROARING FUN begin! (Note: You will need to purchase brads for his joints, which can be found at walmart, amazon or office supply stores). DINOMITE DICE DRAW AND DANCE GAME! Now you can create your own unique dancing dino with every roll of these dinomite dice! All you need are these printable dinomite dice, a piece of paper, glue (or tape) and something to draw with ... AND DON'T FORGET your ground shaking dance moves! With each roll you'll get to know the dancing dinos, learn their names, favorite dance moves and the type of dinosaur they are! There are endless combinations with these dino dice, so get ready to roll with your imagination!